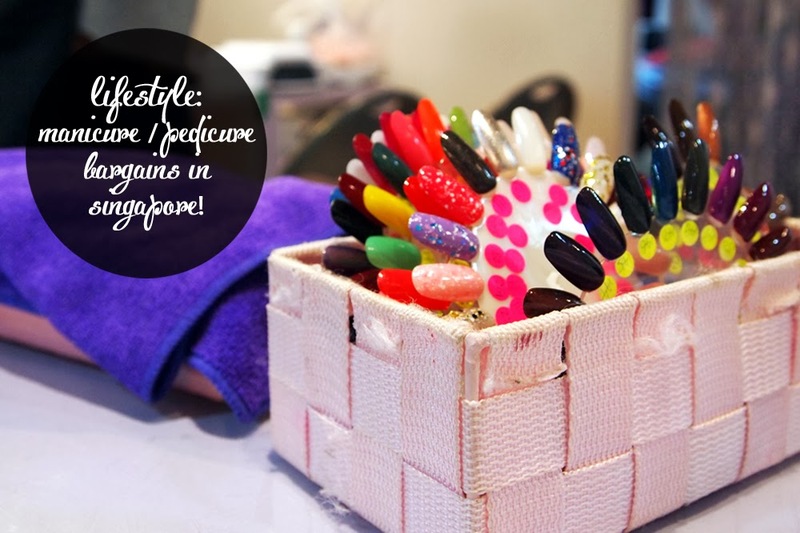 Lifestyle: Manicure/Pedicure Bargains in Singapore! 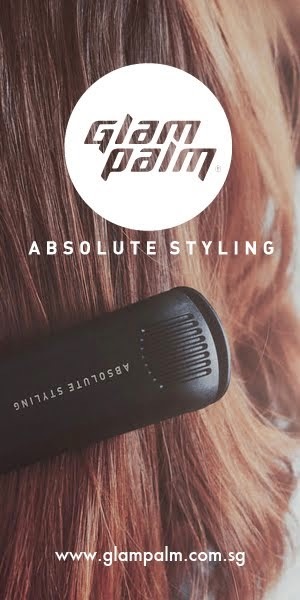 We have decided to section off a lifestyle portion in our blog to add a little flavor, and to bring a little excitement! As you can see, 2014 is a new start for us and we've been thinking of various ways to spice up this humble website! We've been taking in some comments and suggestions, and most of them involve us talking about our daily lives! 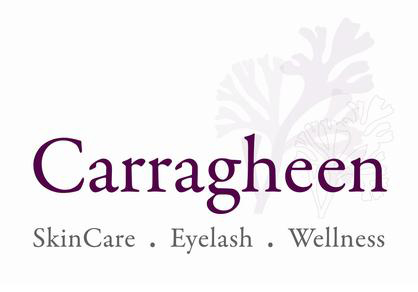 We never knew we were that interesting really, lol, but it seems many people want to know things like where we get our makeup from, where's the cheapest makeup haunts, and where are the best beauty services! Ash and I discovered this place awhile ago, and I personally think it can be defined by the quote "old is gold". 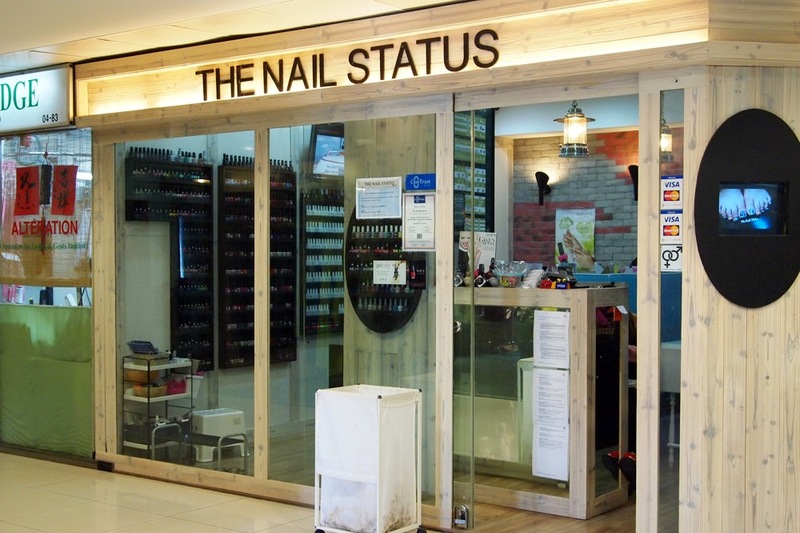 A lot of bloggers also seemed to have visited this tiny nail haven tucked away on the fourth floor of Far East Plaza, and have left with nothing but good things to say! For us, Ash and I aren't too big on designs and the like. We're pretty simple people but mostly it's because we're broke lol who just want our nails to look ever ready! I would say though, that this is the preferred choice for students, up to tertiary level, only because a student pass is required for...... $3 EXPRESS* MANI/PEDIS! Just a heads up.. it turns out that it's better not to refer to the nail charts and to just go straight up to the shelves with rows and rows of nail polish bottles on them (as seen behind Ashley in the above pictures) because that's the fastest way to ensure the color you want is in stock. The colors we chose from the "color wheels" were all out of stock, so we just took the shortcut haha. Anyway, we watched some Revenge on the TV they had on screen at the shop (Ash loves that show) and just basically kind of gossiped our time away. There are magazines behind the chairs in case you ever go alone and would like something to read as well! BTW: Do remember to make appointments! Even 30 minutes beforehand would be good because they're usually packed to the brim! They even end up turning away customers sometimes, so if you're really IN NEED of a mani/pedi do book them in advance! I found out about this place from one of my close friends, and it's a GEM. I almost do not want to share this because my favorite place will be jam packed - but hey, all good things have to be shared. 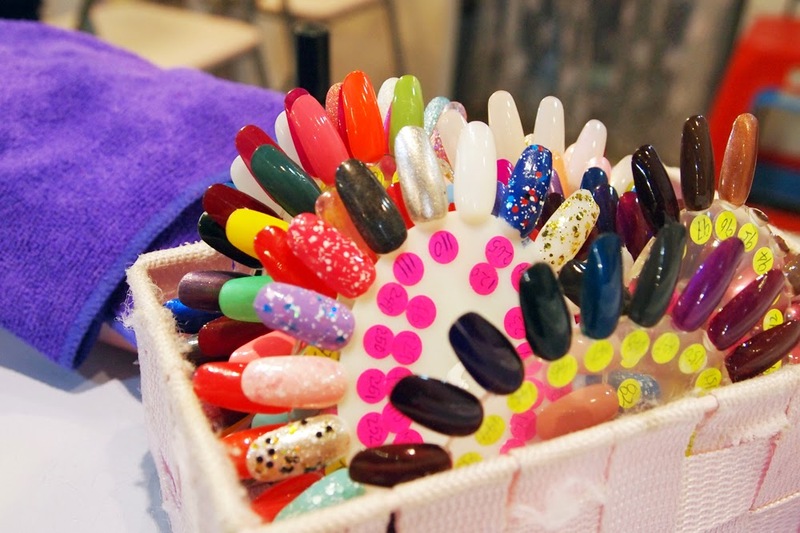 I go to to Lily Nails Salon for.... *drum roll*.... $16 EXPRESS GELISH MANICURES (free soak offs included)!!! And this is without even a need for the student pass, should some of you pretty working ladies be interested in going! I would say that the time taken for this whole process is quite difficult to determine because it really depends on the time of day you choose to go. If you go during lunch/after work hours, the queue will naturally be longer. However, if you go at odd timings, say about.. 4.30pm, you might not even have to queue at all! And the whole thing will be done in a maximum of 30 minutes. Truly not bad. The wide assortment of gelish/classic manicue colors is also pretty impressive I must say! Ash and I both took quite awhile before actually deciding on the ones we wanted! In the end... to match what we had on our feet already.. I went with a dark plum and Ash went with a grey-toned lavender. 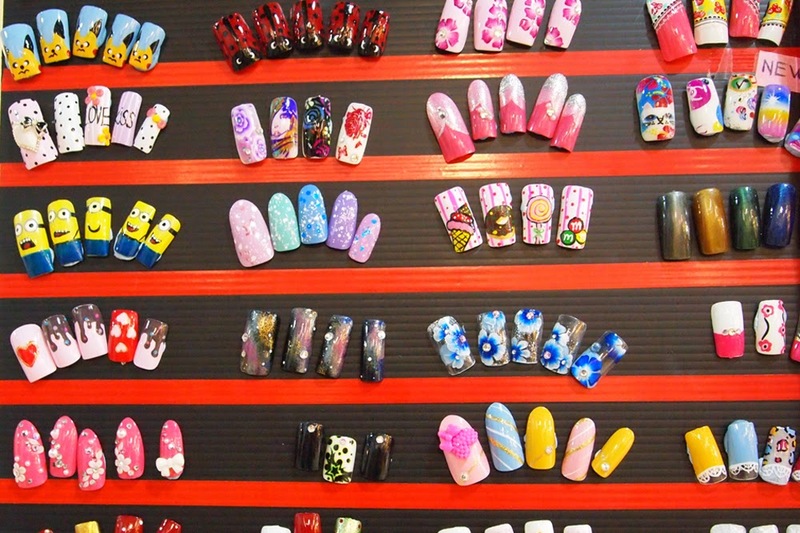 We were both pretty much in-and-out customers because we had no special requests and we didn't do any nail art... I think it was a fast job for the ladies there haha. Here you go! Our final nail colors! Do you like them as much as we do? We thought they actually suited our characters quite well! 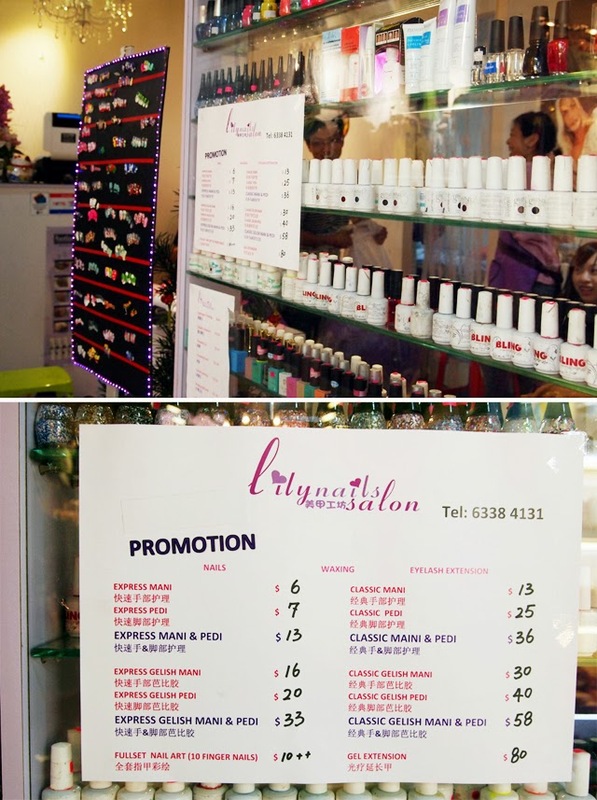 :) The price chart is up for Lily's Nail Salon, but we kind of missed out on The Nail Status' one.. you can always call them to find out more if needed! We hope this post has been helpful to you guys! Love it ladies!!! Those two shades are my favorite shades of all time! They're just so decadent but simple at the same time! Hehe :) so easy to match everything and anything!! We've tried their express gel manicure but we just got a solid colour done, nothing fancy. They did a pretty decent job at it, nothing too shabby of any sort :) Definitely worth your $16! As far as any other services, we've yet to go back and try it out for the moment. Hello :)) May I know if these salons are reliable? I heard some salons state 2 dollars for nail art but when you go there they charge exorbitant prices. Do they have stated lists and so on? I've never tried nail art at Lily Nails Salon (the bugis one) as I normally want a quick simple gelish to go when I'm there. As for Nail Status, I did do nail art once, and by nail art I mean.. Let's just use 1 hand in this case. So I had all nails back except for my fourth finger where it was colorless and I wanted to paint a panda's head at the tip. Considering that $30 was the Express Gelish price for students... I ended up paying $64 if I'm not wrong. So that means I paid an extra $34 (I THINK! This was in 2013 so my memory is fuzzy forgive me) for just an extra colorless nail with a panda head. I don't know if that is exorbitant to you, but it was to me. :\ Then again I don't usually do nail art and other places seem to charge about the same. I hope this helps! "a student pass is required for...... $3 EXPRESS* MANI/PEDIS! *Express: Just painting only, no shaping no cutting no nothing. For those, you have to pay an extra $5"
yes it does! We just cut ours at home and shape it slightly with some those nail files then head down haha.